It's been a while since I've taken the time to post here. In the meantime a lot of projects, exhibitions and performances happened. Strings has been been updated and exhibited in the Tekniikan Museo in Helsinki, several new projects were finished and exhibited and some design and concept work was done. They should all be available on here soon. For now the most notable new development is my collaboration with Marloes van Son as ALOES. Marloes does performances with her self-built electronic devices, I started toying with some visuals for her performances. The collaboration evolved into a series of experiments to unify sound, composition and visuals into a whole. This video is an edit from some of the documentation we got from our performance at Ääniaalto III. 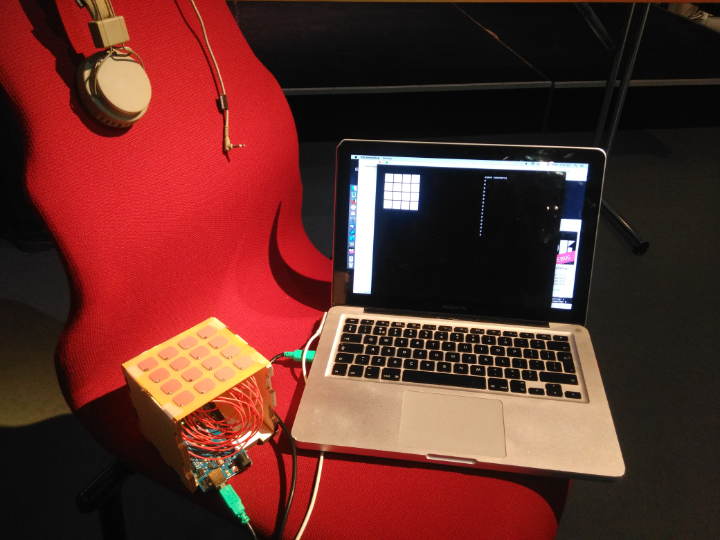 For the SOPI Physical Interaction Design course in december I developed a prototype device that is in the basis is a simple sequencer with a 4x4 setup of tactile pads. In its first state a single sound is mapped to each of the pads, the device registers and remembers all input to determine sequences played. If a sequence is recognised the device will start monitoring the popularity of that sequence and eventually replace the single sound of one of the triggers to that sequence based on the popularity of the trigger. This system keeps on replacing triggers and sounds, slowly pushing out creative and new options for a set of predetermined sequences, causing the system to resemble the current state of music: boring similar tunes with limited variation. 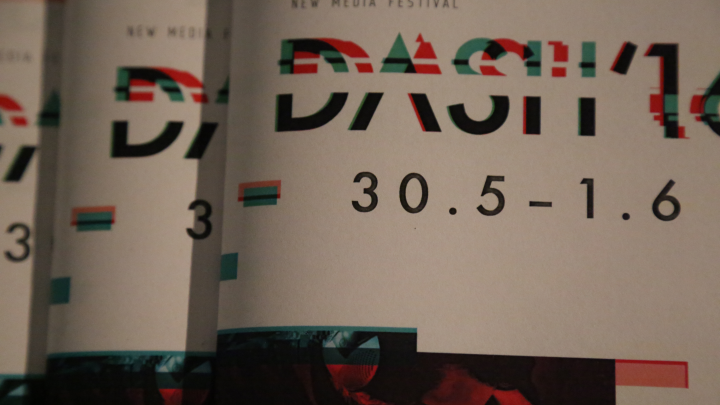 In May and June 2016 I organised the DASH'16 New Media festival in Helsinki together with two others and a bunch of help from even more people. A massive thank you to everyone who organised and helped out, especially Johanna Lehto, Camilo Sánchez Carranco, Mercedes Said and Elisa Spigai. For a smaller project I'm doing in between I needed to stream twitter data, wasn't as easy as I hoped it would be, but it works now! 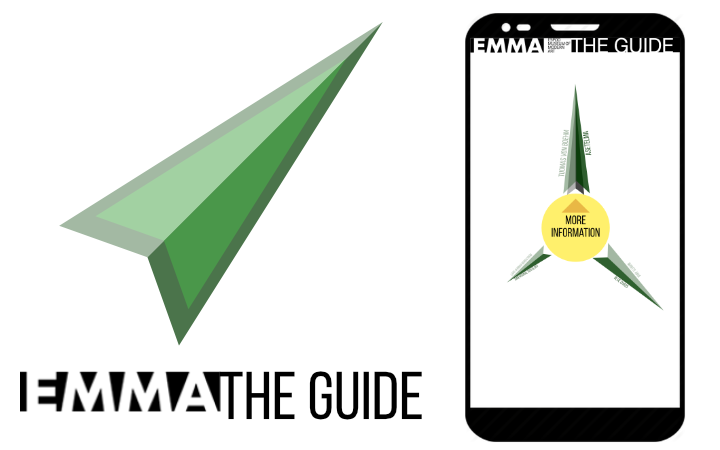 Stay tuned for the project! I'm currently working on a project together with Juan Beladrich (http://www.juanbeladrich.com/) about art, film and continuity. The project is a combination of a film by Juan and a system by me. The system will consist of a number of wires that can be connected by the visitor. The connections made will influence the sequence, speed and sound levels of the film. 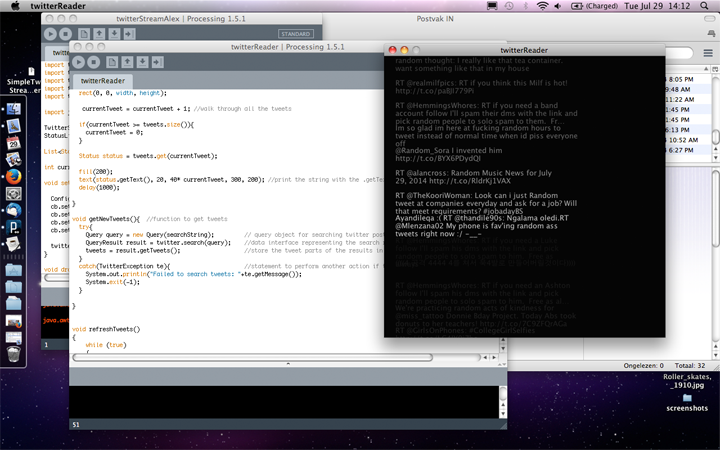 For the project I'm going to work with a Raspberry Pi and openFrameworks. It's been a while and the old site got... Kind of old. Since I'm back in business it was time for a new site. Enjoy it.